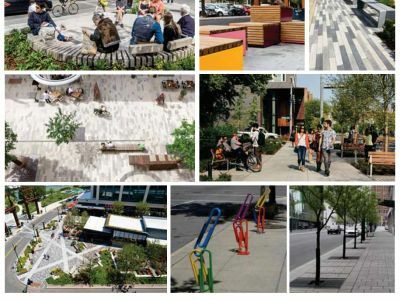 In the spring of 2018 stakeholders and community members helped us identify what the future of 37 Street S.W. could look and feel like. 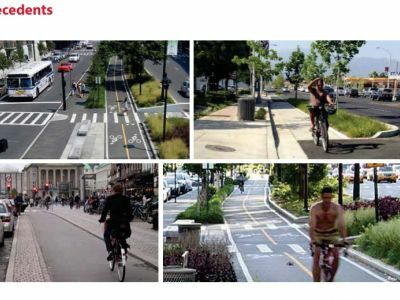 Put pedestrians first; ensure travel options for all users: Design for a pedestrian experience that is playful, inclusive and accessible, easily navigated and that serves all modes of transportation along 37th St. Create a vibrant, all-seasons destination: Transform 37th St into a fun, lively inner city destination and a place of social gathering. We do this by ensuring 37th St is accessible, inclusive, and offers a safe and secure environment in all seasons. 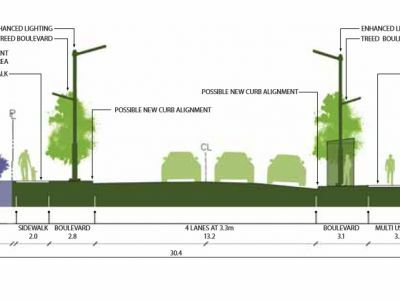 Increase the green: Enhance and beautify 37th St with tree planting and landscaping. Do the Project Principles support What We Heard from the Community in previous engagements? 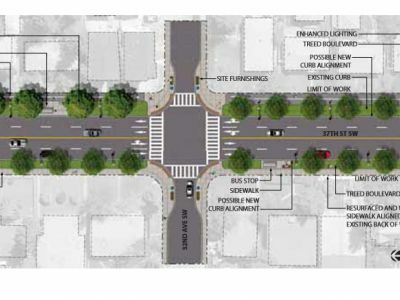 Zone 1 is envisioned as a Neighborhood Boulevard interfacing with primarily commercial uses. 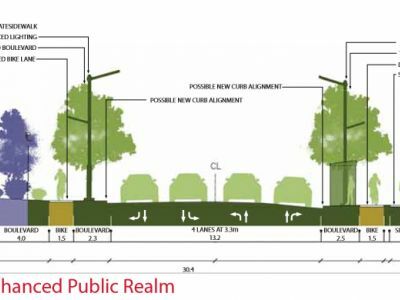 By reducing lane widths on 37 Street the space will provide opportunities for landscaped boulevards, street trees, improved lighting, wider sidewalks and a multi-use pathway. 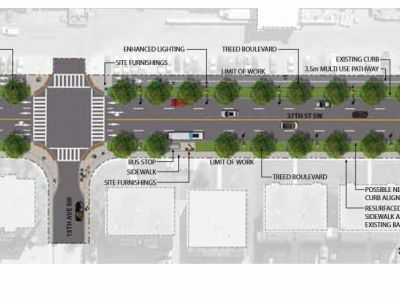 With time, this section can evolve to include more urban streetscape elements and separate cycling facilities, particularly if Westbrook Mall redevelops. Zone 2 is envisioned as a Neighborhood Boulevard interfacing with residential uses. Pedestrian safety and comfort for families living on and around 37 Street is a key priority, as is the protection of mature trees. 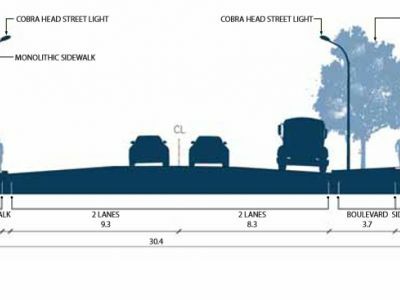 Landscaped boulevards, wider separate sidewalks and a multi-use pathway can be considered by reducing lane widths on 37 Street. Front yard interfaces can be respected by keeping the street improvements within the existing footprint from back-of-sidewalk to back-of-sidewalk. 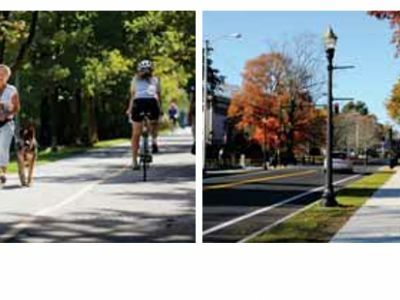 Zone 3 is envisioned as a Local Arterial street interfacing with residential uses. Pedestrian safety and comfort for families living on and around 37 Street is a key priority, as is the protection of mature trees. 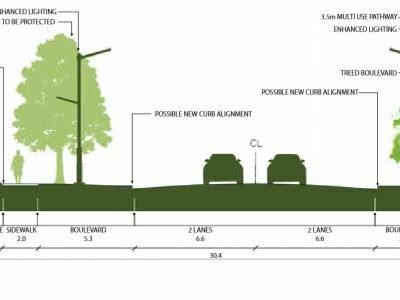 Landscaped boulevards, wider sidewalks and a multi-use pathway can be incorporated by reducing lane widths on 37 Street. Both new and existing homes including one with a historic designation are respected by keeping the improved street within the existing footprint from back-of-sidewalk to back-of-sidewalk. The Bow Trail intersection is the northern gateway to the 37 Street Main Street. The intersection is a highly constrained area, with limited public right-of-way, skewed geometry and poor pedestrian connections. 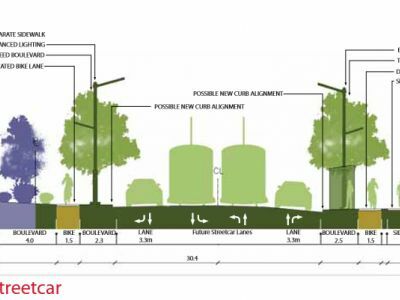 Narrowing the roadway by removing one southbound lane may provide additional space to continue a streetscaped Neighborhood Boulevard up to the threshold of Bow Trail, including wider separate sidewalks and a multi-use pathway. 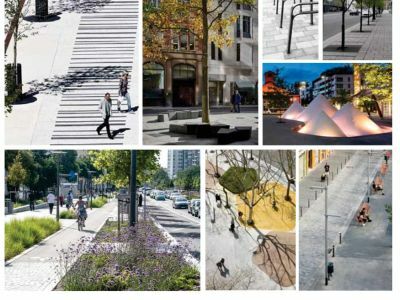 Providing space for a landscaped boulevard and street trees will create a sense of gateway and strengthen the identity of the street. 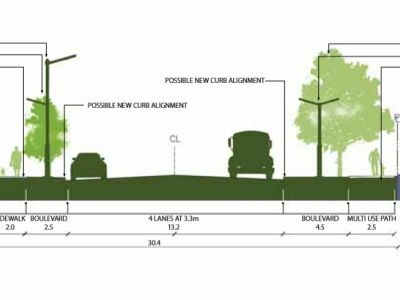 The timing and extent of streetscape improvements at Bow Trail will require additional technical review by The City of Calgary including Transit and traffic operations. The 17 Avenue S.W. 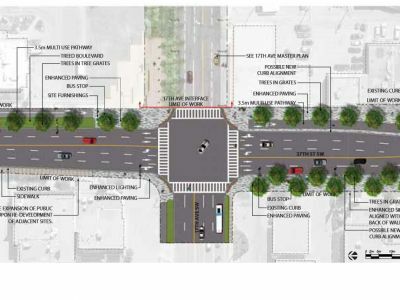 intersection is a key focal and circulation point where the 37 Street and 17 Avenue Main Streets come together. The intersection features commercial uses and will continue to grow as a vibrant, urban area with local shopping, dining and employment amenities. Modest urban elements in the streetscaping help activate the business frontages along 37 Street while allowing possible redevelopment to occur over time. The intersection functions as a transition area between the commercial environment to the north and residential character to the south. 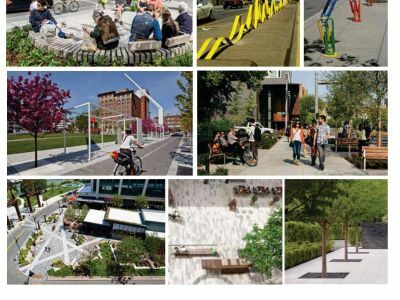 Improved walking and cycling amenities will connect the Main Streets with local business, retail experiences, and the nearby Westbrook LRT station. The 26 Avenue S.W. intersection is a local focal point for commercial activity and a station location for the new MAX Teal BRT service. 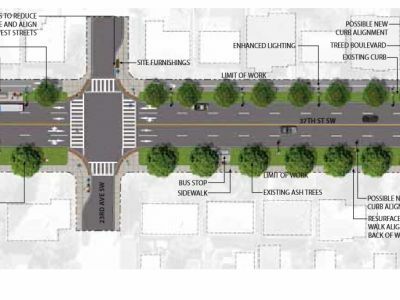 The streetscape here highlights its proximity to transit, cycling routes and area schools. 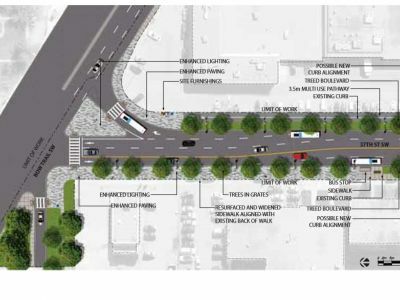 By removing the existing left turn lanes on 37 Street, wider boulevards and sidewalks can be provided along with urban elements to improve pedestrian circulation, safety and comfort. 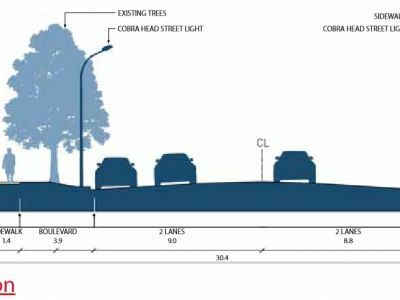 The timing and extent of streetscape improvements at 26 Avenue will require additional technical review by The City of Calgary including Transit and traffic operations. The Richmond Road intersection is the southern gateway to the 37 Street Main Street. The intersection is a highly constrained area, with limited public right-of-way, skewed geometry and poor pedestrian connections. Pedestrian activity is high around AE Cross School, local businesses and a new transit station on the MAX Teal BRT line. 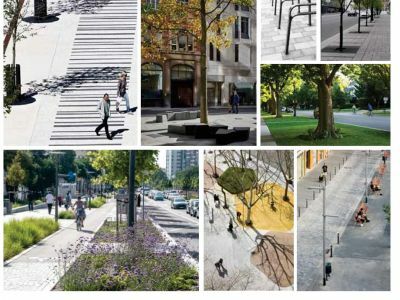 Wider boulevards and sidewalks can be incorporated with modest narrowing of the existing traffic lanes, to improve pedestrian circulation, safety and comfort for all users and particularly students. 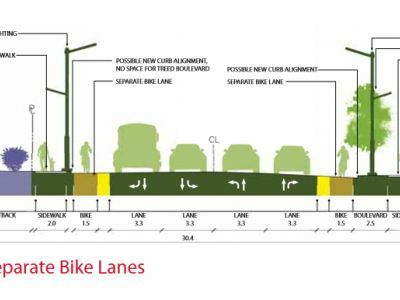 Alternative options are being evaluated to convert a portion of 37th Street to 3 lanes only and to provide additional space to add a separated two-way cycle track. 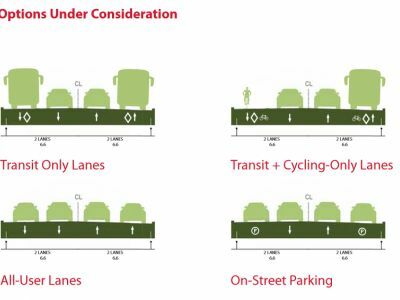 Alternative options are being evaluated to convert 37th Street to provide additional space for two separated one-way bike lanes. Most of 37th Street has a “Bylaw Setback” area which will allow future expansion of public space when adjacent properties redevelop. 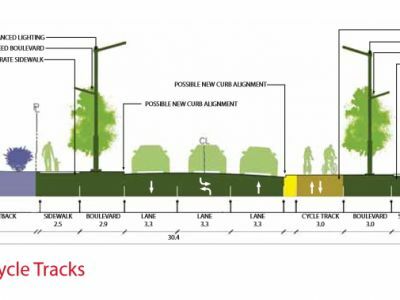 Using the highest rated option as a baseline, this alternative shows the possible future evolution of 37th Street to include the cost-effective addition of bicycle tracks, street trees and boulevard enhancements if the Bylaw Setback becomes available in the future. 37th Street has been identified as a possible future route for a streetcar connecting Mount Royal University with Westbrook Station. 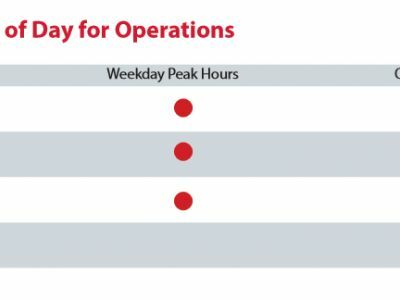 Timing for the streetcar is currently expected to be 30+ years. 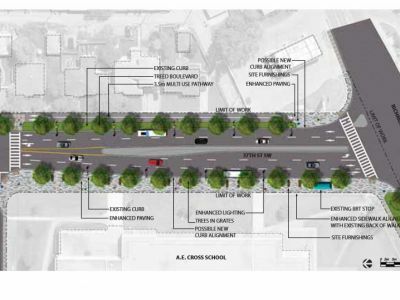 This alternative shows the possible future evolution of 37th Street to include the streetcar in the middle lanes. 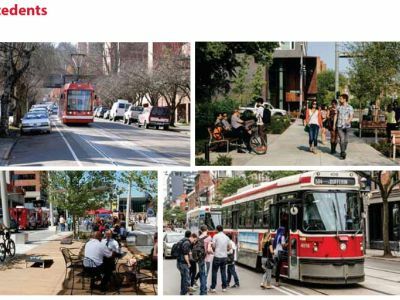 When the streetcar is implemented, on-street parking would no longer be accommodated on 37th Street. 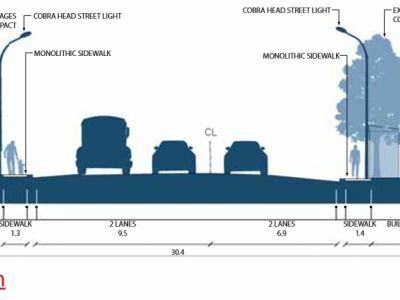 Preserving a 4-lane cross section on 37th Street could allow for a variety of uses on the outer travel lanes, including alternative uses during the weekday peak hours (7:00 to 9:00 am and 4:00 to 6:00 pm). 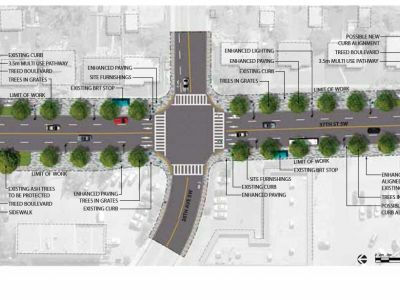 This board illustrates some of the options that will be considered for the 37th Street SW Streetscape Master Plan. Feedback is now closed. Please click here to view the 'What we heard' report. Does the highest ranked design option achieve the project objectives? Are there other strategies we should consider to better achieve the SOCIAL & ECONOMIC objectives? 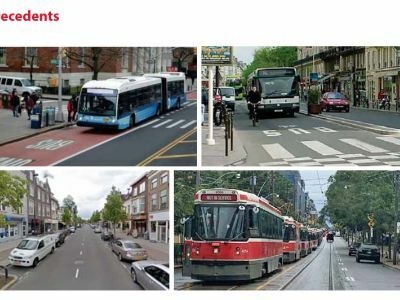 Are there other strategies we should consider to better achieve the MOBILITY & FUNCTION objectives? Are there other strategies we should consider to better achieve the CHARACTER & IDENTITY objectives? To stay up to date on the latest news, subscribe to our email list.